eZee iMenu integration with eZee BurrP | eZee now available on all major Social Networks. Welcome to eZee Insider, your monthly gateway into all things eZee. In this edition, learn how restaurants can benefit from eZee iMenu integration with eZee BurrP!. Also, how new products from eZee benefit current clients and new social media channels to contact us. eZee iMenu, digital menu specifically designed and developed for restaurant and catering industry for iPads and Android Tablets. Application will allow restaurateurs to create their own customizable and interactive digital menus, which can be used by the customers or the waiting staff. eZee BurrP!, Restaurant POS is integrated with eZee iMenu will give unprecedented control over menu editing. The staff will be able to update menu items and rates from the POS which will reflect on the eZee iMenu application across all the synced tablets. 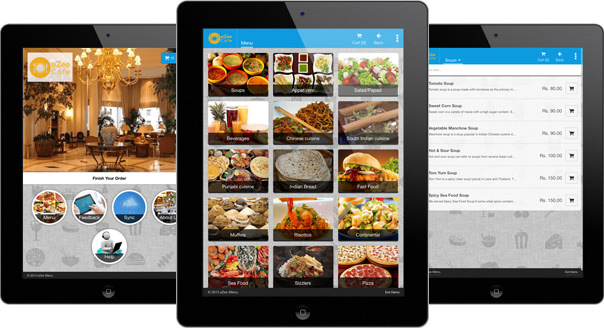 eZee iMonitor will enable staff to update their menu easily to the connected tablets without any hassle. User-friendly interface offers a smooth navigation of the menu and placing orders is blazing fast. eZee iMenu will help in improving customer service and enhance revenue generation capability of the business. It is as simple to use as it sounds, once the order is taken the payment instructions can be set such as pay on the spot or at the time of pickup/delivery. eZee iMenu compatible with eZee BurrP! POS making it simple to adapt into your restaurant and the restaurant menu is always up-to-date with latest changes. Continental Condominiums Motel and Apartments has been a eZee customer since 2007 using eZee FrontDesk as their property management system. Continental Condominiums is located at Sunset Beach, North Carolina in USA. online and had requested information on eZee Reservation. Just within in few days of clear and precise communication, Continental Condominiums decided to go with eZee Reservation as their online booking engine. Communication is the key, by knowing and understanding our customer's needs is the centre of every successful business relationship. At eZee, we always aim to know our customers better and take their opinions to further improve our business process. eZee Reservation will help Continental Condominiums to offer their guests ability to book directly from their website and with seamless integration with eZee FrontDesk , the staff will be able to keep track of all the bookings in the system. eZee takes pride in knowing the latest industry trends and expanding products offering accordingly. Today we are a provider of complete IT solutions provider for the industry which directly benefits our clients who are able to take advantage of ever expanding products and services. North16Goa, situated in North Goa Postcode 16 has adapted eZee's Booking Engine – eZee Reservation and Channel Manager – eZee Centrix. The 5 start resort is 15 minutes walk from Calangute beach, boasting 135 rooms spreading across 8 corridors showing off its modern décor. been integrated into their website. Guests now can directly book with the hotel with ease without any hassles. eZee Cenrix on the other hand takes care of their online distribution across all the connected international and local travel websites. North16Goa are able to manage their rates and inventory across all the OTA's and GDS without ever worrying about double booking. Norht16Goa with its gorgeous modern architecture offers highest level of comfort and convenience with 24hr room service, business center, concierge services, internet access, and lavazza coffee machines in every room. With eZee Reservation and eZee Centrix coupled with North16Goa's staff's hospitality ensures that all the guests' needs and reservations are taken care of. Citihub Hotels, well-known business hotels in Indonesia has implemented Zee FrontDesk as their property management system in three of their branches. In addition to eZee FrontDesk, the group of hotels has also implemented eZee Reservation and eZee Centrix for their online presence. eZee FrontDesk provides the hotels with a flexible yet simple to use system for efficiently managing their daily operations and keep up with the highest level of customer service set by the group. eZee Reservation will naturally fit into their website and provide travelers to book their stay with the resort with minimum fuzz and increase resort's direct bookings. eZee Centrix will blend in their natural business environment and allow their staff for better management of bookings and gain better online presence. Citihub hotel will also benefit from the seamless integration between the eZee products. eZee products have been implemented at three of their Citihub Hotels at Pecindilan, Jagoan, and Gubeng, and further plan to expand their brand across the country in 2014. eZee wishes the best and looks forward in building a long term relationship with Citihub Hotels Group. eZee is fortunate to have great customers and partners across the globe with amazing set of employees. Communication is the key to successful and strong relationships. With the rise in diversity of social media, everyone has their favorite way of communicating with or about their favorite brand. Keeping that in mind, we have recently expanded our social media reach with new channels, where you will be able to directly communicate with us, share about us, and keep up with the latest news and updates. You can find us on the above social media channels.